Public safety leaders who are ready to become more effective agents of change. Increased capacity to diagnose challenges in your organisation and its operating environment. Development of interventions to help others change. Personal capacity to face and overcome resistance while remaining open to others’ perspectives,wisdom and good intentions. Evolve explores the following topics and themes through classroom discussions, group projects and individual reflection. Examine your deeply embedded assumptions about leadership. Consider how your own values, beliefs and behaviours may have been limiting your effectiveness as a leader. Examine the relationship between leadership and authority and explore different ways of exercising influence. Analyse what leadership means in the context of multi-agency, multi-role and multi-jurisdictional perspectives and whole-of-government solutions. Explore the distributed leadership approach. Examine individual and systemic impacts on change. 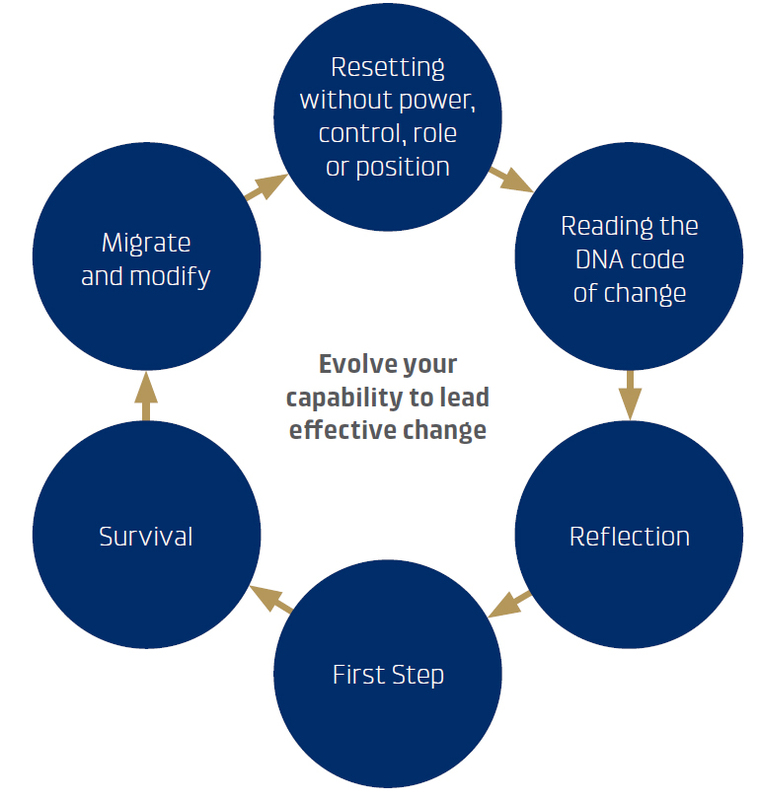 Consider the evolutionary nature of effective change leadership, as outlined in the diagram below. Explore a range of leadership strategies and consider new ways of exercising leadership. Confront the risks associated with exercising leadership. Consider how bringing an open mind to a complex environment can help you generate innovative solutions and identify hidden opportunities. Devise new ways of increasing your capacity to meet the many different challenges that will come your way.